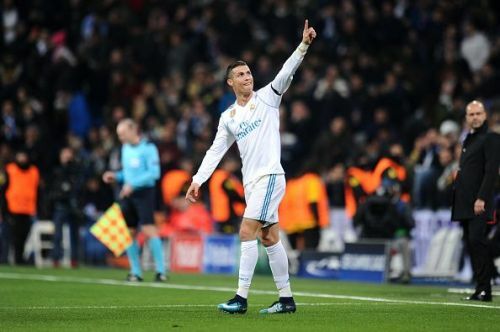 Cristiano Ronaldo became the first player in UEFA Champions League history to score in all 6 group games of a single season, as Real Madrid beat Borussia Dortmund in a thrilling encounter at the Santiago Bernabeu. Quickfire strikes from forward Borja Mayoral and Ronaldo helped Real race to a two-goal lead, before Pierre-Emerick Aubameyang struck on either side of half-time to bring Dortmund level. Lucas Vazquez then sliced his shot past goalkeeper Roman Burki in the late stages to win it for Zinedine Zidane's side. The game was inconsequential from the defending champions' point of view as they would have finished second, regardless of the result. As far as Dortmund were concerned, the result, combined with APOEL Nicosia's defeat at Tottenham, meant that they will compete in the Europa League. Albeit inconsequential in terms of the teams' standings in the group, the game was a spectacle to watch and it was made possible only thanks to Madrid and Dortmund providing emphasis on attack rather than defence. Both teams looked to press the other in possession and create potential goal-scoring chances. While Madrid dominated the first and last quarters, it was the visitors - led by the dangerous Pierre-Emerick Aubameyang at the number nine position - who kept Real under pressure between the 25th and 65th minute of the game. He was lethal in counter-attacks and deserved his brace. Shinji Kagawa and Christian Pulisic ran the hosts' defence ragged with impressive performances, playing off Aubameyang in attack. Both sets of full-backs or wing-backs - Real Madrid's Theo Hernandez, in particular - constantly surged forward and put in delightful crosses for the forwards to attack. Dortmund can be given great credit for putting in a spirited performance, although their efforts counted for nothing in the end.